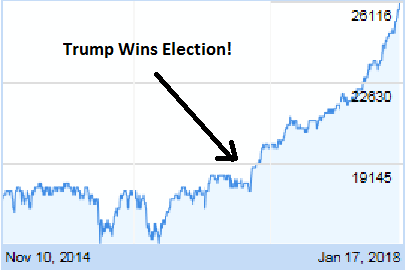 President Trump is Right – US Markets Up Nearly 50% (44%) Since 2016 Election! President Trump gave a speech today at Devos to world government, academic and business leaders at the World Economic Forum. He stated in his speech that the US stock markets are up due to his policies and programs where the markets would be down by the opposite amount had Hillary won! President Trump is right. He stated that US markets are up by nearly 50% since his election. (The Dow is up 44% since the 2016 election as of yesterday.) He also stated that the markets have hit 84 all time highs since the election. He actually understated the correct amount. As of yesterday, with the Dow reaching another all time high, the Dow reached its 98th all time high since the election. President Trump’s stock markets hit many records in his first year in office as noted in many previous posts here at TGP. The stock market on Wednesday, January 17th, 2018, says it all. On that day the Dow broke 26,000 points for the first time in its history. As a result the Dow broke the record for the fastest 500, 1,000, 2,000, 3,000, 4,000, 5,000, 6,000 and 7,000 point increases between major milestones in the history of the Dow. All of these increases occurred since Donald Trump was elected President. Yesterday the Dow landed at 26,392. The President also stated in a question and answer period that he believes that if Hillary Clinton would have won the Presidency that the markets would be down nearly 50% because of the business suffocating policies of the Obama Administration that the Hillary team was sure to continue. Next month Americans will receive more money in their checks due to lower taxes from the Trump Tax Cut law just passed. As time goes by, Americans will see more and more the blessing that President Trump won the 2016 election.